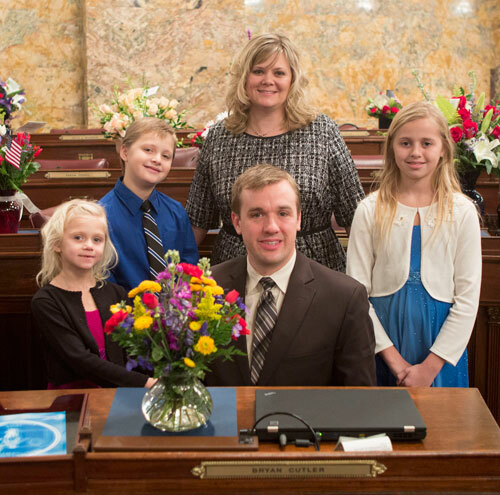 Rep. Bryan Cutler’s wife, Jennifer, and their children, Drew, Caleb and Cheyanne, join him on the House floor during swearing-in day on Jan. 6. HARRISBURG –During the swearing-in ceremony of the Pennsylvania General Assembly held today at the state Capitol, Rep. Bryan Cutler (R-Peach Bottom) was sworn into his fifth term of office as state representative of the 100th Legislative District. Cutler will be serving as the majority caucus whip with Republicans having the largest House majority since 1958. He will be responsible for tracking House votes and informing his other 118 Republican colleagues on upcoming issues and legislation. In the new session, Cutler plans to lead the caucus by focusing his legislative agenda on advocating for policies to make the health care system more accessible and affordable, supporting small businesses and removing barriers to job creation. By sharing his monthly legislative expense reports on his website and Facebook page, Cutler continues to promote government transparency.